After months of speculation, the world's third-largest advertising network, Publicis Groupe, has acquired Law & Kenneth, the New Delhi-based independent agency led by adman Praveen Kenneth. The deal, whose size could not be estimated immediately, was signed in France on Wednesday. The acquired entity will merge with the Indian unit of Saatchi & Saatchi, a Publicis Groupe agency, to form L&K Saatchi & Saatchi. Notably, the website of Law & Kenneth already carries the logo of the merged entity. The revenues of the combined unit are estimated to be Rs 50-60 crore. This is primarily on account of Law & Kenneth, which counts advertisers such as Dabur, ITC, Renault, Jockey and the Hero Group among its clients. Kenneth will take over as the chairman and managing director of the combined unit. He will also have a stake in the combined entity, persons in the know said. Kenneth could not be immediately reached for his comments. The 44-year-old former Publicis hand, who rose to be CEO of Publicis Worldwide (India) in the late 1990s and early 2000s, started Law & Kenneth in 2002 along with British adman Andy Law. At that time, the agency was called St Luke's. It was eventually renamed Law & Kenneth in 2004. A few years ago, Kenneth bought out Law's stake in the agency to take full control of the business. 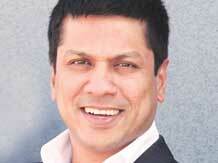 Key members of Law & Kenneth include CEO and managing partner Anil Nair, who is regarded as the No. 2 in the agency. Other members include Anil K Nair, the head of digital, and Sandhya Srinivasan, planning director. For Publicis, which is seeking approval for its $35.1-billion merger with Omnicom, the current transaction will add one more agency to its growing size in India. The Paris-headquartered firm is looking to double its revenues by end-2014. Publicis' key acquisitions in the past include that of Mumbai-based ad agency Beehive Communications in October 2013. This was done by flagship agency Publicis Worldwide. The group has also steadily added businesses on the digital side in India in a bid to consolidate its position in that area. On his visit to India last month, Publicis Groupe chairman Maurice Levy had reiterated the importance of the market to his network's scheme of things. "Emerging markets give us a quarter of our revenues at the moment. The gameplan is to take this number to 35 per cent in four years. India, among other markets such as Brazil and China, will play a key role in our endeavour to achieve this," Levy had said.